You are here: Home / Note Buyers / 10 Tools For Marketing Your Note Business Online! 10 Tools For Marketing Your Note Business Online! We just returned from a great gathering of note investors at the first annual Note Expo in Dallas Texas. As promised during the presentation I am sharing the main points from my power point slides along with the tool links. If you weren’t able to attend this year’s convention I’m sure you’ll still find these tips helpful. Thanks to everyone for attending and being such an appreciative audience. So Why Should You Consider Marketing Online? When starting in the note business back in 1988 we relied heavily on direct mail, paid ads, and referral marketing. In 1997 we built our first note website which was pretty much a brochure site. Tired of spending close to $5,000 per month in marketing we decided to figure out the online realm to reduce costs and take advantage of technology. At first it was a frustrating experience until we discovered the WordPress Content Management System in 2008. 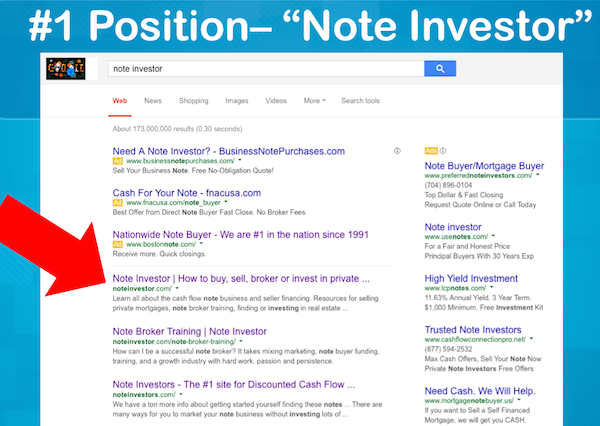 Since then we’ve been able to reach the #1 Organic Position For Term ‘Note Investor’ out of 170+ million results! 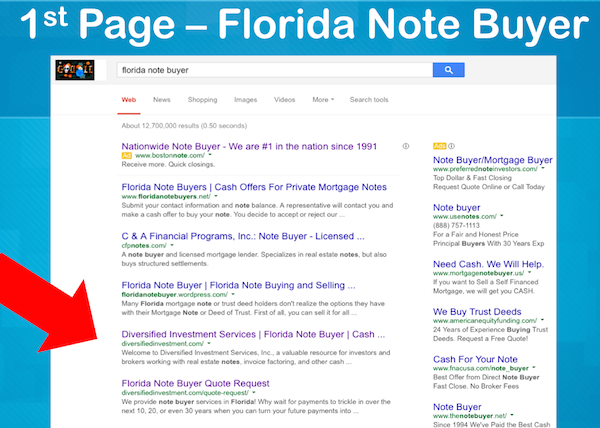 We’ve also obtained first page results for the term ‘Florida Note Buyer‘ for our company site out of 12+ million results! Pay Per Click (PPC) – The paid ads found at the very top and to the right of search results. Organic Search – The natural or free results in search engines. Social Media – Networks ans social profiles based on the sharing of information . Hosting – This relies on a bank of computer servers where your web site is actually housed. Your site is made up of files which must be stored somewhere. The hosting cost covers the storage and the ongoing bandwidth needed for people to see your site. Hosting should include Control Panel Access (CPanel) and FTP access for installation of your site. Email – Either the domain provider or the hosting company can provide a company email address that matches your domain. Stop using and email like SkippyLovesCats479@aol.com and get something professional like info@domainname.com. Paid Tools:Domain Registration is less than $15 year through sites like Godaddy.com while Hosting plans generally runs under $100 year. If you plan to expand your site with content marketing select a user and search friendly Content Management System (CMS). WordPress is our preferred CMS. There is a .com and a .org version. Paid Tools: A variety Premium Themes are available. For our personal sites and the sites at NoteBuyerSites.com we use themes from Studio Press. Photos with Alt Tags (Be sure to use licensed photos). Quality Inbound Links – Online Yellow pages are a good place to start building links to your site. A good database management company will make it easy to email a group and keep you in compliance with anti-spam laws. We personally use Aweber which is a paid service but there are good free tools as well. For our note business we have found Linked In to be a great asset and current have a Note Investor Group with over 3500 members. 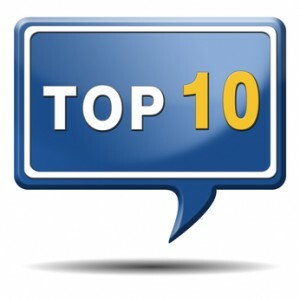 We Are Here To Help You Avoid the Mistakes and Implement the Top 10 Tools With Note Buyer Websites! Hi. I greatly enjoy and appreciate your content. I have a great deal of proven success in direct telemarketing and have been successfully applying it to my cash-flow note business. Is there an easy way to find out the median “hold term” (median amount of time most note-holders tend to hold on to notes before they get itchy to sell) of most notes in a given real estate market? For example I am from NYC so do a lot of public records searching there and it sure would be profitable to know about how far back to go time wise to find the largest group of note-holders most likely to be ready to sell.